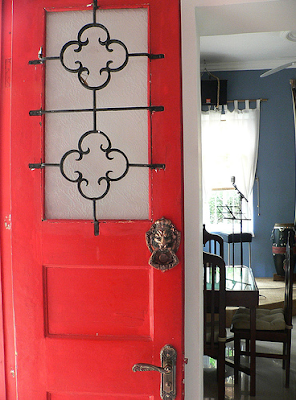 A 2009 color trend in the making- red and blue. But not in a Fourth of July way- in a bolder, richer way. If you have a room with blue walls already, try throwing in some glossy red accents and see how they just pop against the cooler back drop! I’ve done it in my own home (see below) and you should too! 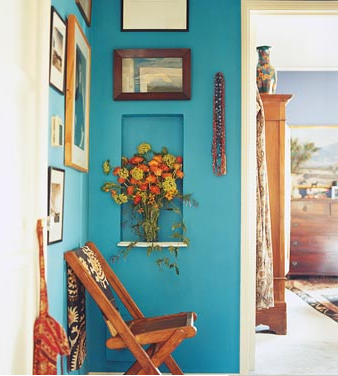 The pictures below show you a range from really bold pairings to very, very subtle ones. I love all the red and blue. 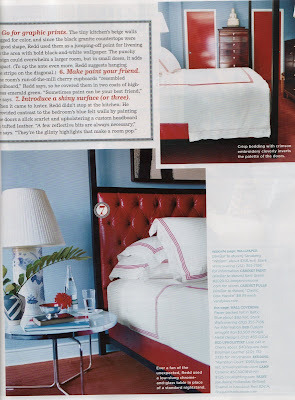 When I saw the pics in Domino this month from Miles Redd I was so excited! Great collection of pictures! Beautiful! I love this color combo it is one of my favorites! Does anyone know the paint company and name for the first photo? 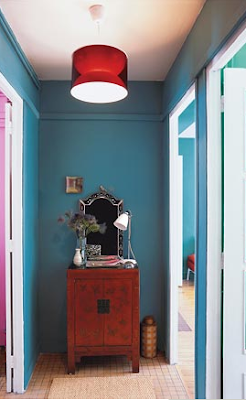 I’m looking for a color like this for my son’s room. Your help is greatly appreciated. I really love this combo. 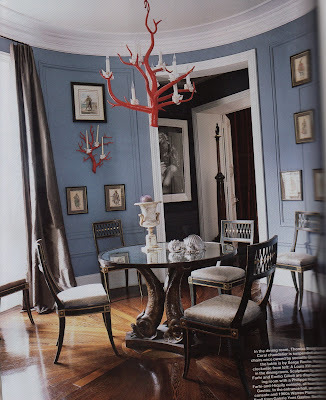 I have a blue bedroom, it is called Hazel..gonna have to add a splash of red in there! This is one of my favorite color combos…love that you’ve showcased how you to accomplish the look in both a subtle and bold way! I made some delicate paper chains for my Christmas tree out of thin strips of white, red, and blue paper–the same tones of red and blue as in your post. The chains look more sophisticated than the usual red and green, yet still Christmas-y. Lovely! I’m also a big fan of a turquoise shade of blue and red. yum! This is hands down my favorite new color combination! What beautiful rooms. My Christmas cards are blue and red this year…I thought it was an interesting and unusual combination. Even my conservative husband liked the look! Reading this post makes me feel like I am on the cutting edge. Hey, this is my color scheme! Has been for years. So nice to know that I was WAY ahead of the trend for once in my life. 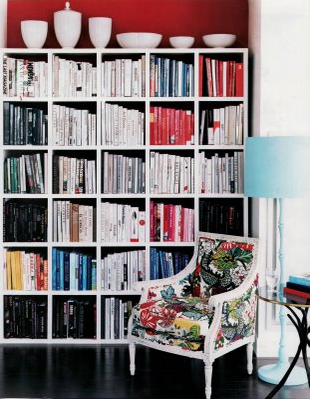 :) Thanks for the photos of totally inspiring rooms!